The list of quests by hold doesn't yet completely guide through the major contingencies. Reunite Skyrim under the leadership of the Empire. This quest governs the overall progress of the Civil War for the Imperial Legion. It serves as an "umbrella quest", taking you through a series of individual quests that you receive as it progresses. The overall goal of the quest is to conquer for the Empire, each hold of Skyrim that is currently under Stormcloak control. You will accomplish this one hold at a time, by taking control of the military fort in each. The holds to be conquered can be altered by negotiations during Season Unending, if you do it before this quest, and therefore there are many possible ways to complete this quest. Without doing Season Unending, only the Stormcloak-controlled holds in the following table need to be conquered. The Imperial-controlled holds only need to be conquered if given to the Stormcloaks during Season Unending. The Stormcloak-controlled holds will not need to be conquered if taken from the Stormcloaks during Season Unending. Eastmarch Stormcloaks Eastmarch Imperial Camp Eastmarch is always the final hold that needs to be conquered. ^1These holds can change sides during Season Unending. One final complication is that when you complete the quest Dragonslayer during the Main Quest, any hold (other than Eastmarch) that you have previously been tasked with liberating is immediately transferred to Imperial control. All remaining quests for that hold are skipped, and you need to return to Solitude to receive the next assignment from Tullius. After defending Whiterun from the Stormcloaks, talk to General Tullius. He will promote you to Quaestor and order you to meet Legate Rikke at the Pale Imperial Camp. Speak to Rikke there using the "Reporting for duty" dialogue option. This will launch the quest A False Front. Complete that quest and then return to Legate Rikke, who will commend you and pay you leveled gold. Report for duty again and she will order you to join a group of soldiers who are staging to take Fort Dunstad from the Stormcloaks. This initiates The Battle for Fort Dunstad quest. After completing The Battle for Fort Dunstad, your journal will tell you to report to General Tullius. When you speak with him at Castle Dour in Solitude, he will commend you then promote you to Praefect. He'll give you orders telling you that you're needed in the Rift. Report to Rikke at the Rift Imperial Camp who will tell you that the steward of Riften is corrupt and secretly in league with the Thieves Guild, something that can be used to blackmail her into giving information that will aid to the Legion. This will begin the Compelling Tribute quest. After completing that quest, return to Rikke who will commend you and reward you with leveled gold. Then report in to her and she will tell you to take Fort Greenwall after meeting the men outside, which triggers the quest The Battle for Fort Greenwall. After completing The Battle for Fort Greenwall, your journal will tell you to report to General Tullius. Do so and he will commend you and promote you to Tribune (he may not mention the promotion, but he will give it). He'll then order you to report to the Winterhold Imperial Camp. At the camp, Rikke will tell you that there are Imperial Legionnaires imprisoned at Fort Kastav and that she wants to turn that into an advantage. This will trigger the quest Rescue from Fort Kastav. After the Rescue from Fort Kastav, your journal will tell you to report to General Tullius (again). Return to Solitude and talk to him. He will promote you to the upper echelons of the Imperial Legion as a Legate and leveled armor as a symbol of your new rank. He wants you to report to Legate Rikke (again) at the Reach Imperial Camp this time. Get there and she'll tell you to take Fort Sungard this time, triggering The Battle for Fort Sungard. Report to General Tullius. He will tell you that the Legion will take Windhelm soon, and to report to Legate Rikke at the Eastmarch Imperial Camp. Report for duty to her there, and she'll tell you to take Fort Amol to use as a staging point to attack Windhelm, triggering The Battle for Fort Amol. After completing The Battle for Fort Amol, return to Rikke who will tell you "We're taking the city. Meet the soldiers gathering for the attack. Move it!" This will start Battle for Windhelm. After the Battle for Windhelm, General Tullius will have a short dialogue with Ulfric Stormcloak, who will request that the Dragonborn be the one to kill him as it will "make for a better song." General Tullius won't care whether you kill Ulfric or not, just as long as he's dead. If you choose to kill Ulfric, General Tullius will tell you to use his sword (which is a leveled sword) to do the deed. If you choose to allow Tullius to do it, the General will reward you with a leveled sword anyway. After rewarding you, the General will rush with Rikke outside to give a speech to the troops promising increased pay and freedom for them to return to their families while giving compensation to families who have lost loved ones. This will end the quest and you're allowed to talk to Legate Rikke and General Tullius on what will happen next. An allied/friendly military camp located within an enemy hold, disappears upon completion of re-gaining that particular hold. This quest is mainly used to move you between the other Imperial quests. This quest and Liberation of Skyrim are different radiant versions of the same quest. If you have progressed Season Unending to the point of a temporary truce, any open quests in this series will auto-complete in the journal. However, the hold in question will not be transferred to Imperial control when it does. After Season Unending you may end up having to "replay" an already completed mission if you ceded control of a hold to the Stormcloaks. Completing Season Unending in favor of the Stormcloaks during the negotiations may prevent General Tullius from promoting you further along the Legion ranks. The Civil War questline proceeds normally, regardless. After starting the quest "The Fallen", Legate Rikke won´t give you option "Reporting for duty" until you defeat Alduin in Sovngarde. Legate Rikke may not be present at the camp when you arrive to report to her, although the quest marker may point to an unoccupied spot within the camp. Waiting for 24 hours may cause Rikke to appear, allowing you to continue the quest. At various points throughout the questline, Legate Rikke may not give you the next mission or will not acknowledge you "reporting for duty". One way to fix this is to ask General Tullius "How goes the war?" until the phrase is no longer white (the indicator that he has something new to say). He will give you some information about every battle you've won, initiating the 'Reporting for duty' prompt with Legate Rikke. Another way to fix the problem is to activate the werewolf form, wait until the end of it, and talk to Rikke again. Using the command "moveto" to move Rikke to another location(inside a city, or an inn, player home, everything but skyrim world), talking to her and then moving her back to imperial camp seems to fix the dialogue. All problems with Rikke not giving "Reporting for duty" dialogue can be fixed by going to another Imperial Camp and using the console command prid 198BB to target Rikke, then use moveto player and talking to Rikke. Head to Tullius in solitude. Talk to him, then exit out and open up the console (might not be necessary but that's what I've done). Enter "GetStage cwobj" to verify the variable is set to 1.00. If it is so, enter "ResetQuest CWObj. Use "GetStage" to confirm the quest stage is 0.00. Enter "SetStage CWObj 1." Close the console window and return to Rikke. You should get the "Reporting in" Dialog option. If nothing else works, you may need complete the entire Reunification of Skyrim quest via the console command setstage cwobj 255. You cannot use the console to start the next quest within the series, as the bug applies to the over-arching quest. After a promotion when returning to General Tullius, he will tell you to "take this blade." You may receive a random leveled weapon, but you may also receive a random piece of armor or shield, any of which may or may not be enchanted. This may be cleared by saving and resetting the entire system. After retaking Winterhold and upon talking to General Tullius, you will receive a piece of leveled armor. However, General Tullius may give you no further instructions and your journal has the text "Report to General Tullius". This prevents the quest line from continuing. There is a way to force Tullius 'What's next' option after he gave you the armor by setting ownership of Winterhold and Fort Kastav to the Empire manually through console command. First, use help 'Fort Kastav' to obtain LCTN: variable (something like 00019182) and help 'Winterhold' (there may be two of them). Then, use GetKeywordDataForLocation %LCTN% CWOwner for Fort Kastav and Winterhold LCTNs to check the owner of this locations; if any of them shows 2 (Stormcloaks), then use SetKeywordDataForLocation %LCTN% CWOwner 1. After that 'What's next' option should appear. There may still be dialogue issues when you reach Winterhold. To prevent this, work through "Reunification of Skyrim" until you finish regaining Fort Greenwall. Before you report to General Tullius, finish the main questline. During "Season Unending", you will be given the option to put Winterhold on the negotiating table. It will most likely be the only option given, since you have control of the other holds thus far. If you choose that option, then all of the Imperial quests regarding Winterhold will be skipped and will automatically fall under Imperial control, without requiring you to attempt bugged conversations. The war strategy maps located at military bases and command headquarters do not update as intended. This issue has been addressed by version 1.2.1 of the Unofficial Skyrim Patch; each map needs to be visited twice for the correction to take effect in saved games. 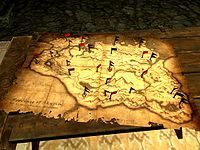 Only stages and objectives relevant to the Reunification of Skyrim (rather than Liberation of Skyrim) are included in the table. 1 I will help General Tullius quell the Stormcloak rebellion and reunite Skyrim by restoring Imperial control. 255 Finishes quest We have successfully quelled the rebellion by killing Ulfric Stormcloak and have reunited Skyrim under Imperial control. On the PC, it is possible to use the console to advance through the quest by entering setstage CWObj stage, where stage is the number of the stage you wish to complete. It is not possible to un-complete (i.e. go back) quest stages, but it is possible to clear all stages of the quest using resetquest CWObj. This page was last modified on 1 December 2018, at 12:17.